Kav points out the songs that feel most different to him are those that ‘lend themselves to being real pop songs.’ Songs such as the aforementioned ‘Losing Friends Over Love’ and ‘The Sound Of Your Heart’ may come as a pleasant surprise to fans of the band. The real difference on Inshalla, though, which may not be immediately obvious to listeners, was in the song-writing and demo process. Eskimo Joe enjoyed the freedom of self-producing their last album, Black Fingernails, Red Wine, but for the complex sounds of Inshalla have brought in a producer to ‘throw a spanner in the works and learn some new tricks.’ The band approached Gil Norton, since they were fans of albums he had produced for the Pixies and Foo Fighters, though his work with engineering sounds for more exotic arrangements with Gomez seems more identifiable on Inshalla. Kav says that Norton was particularly influential in that early development of the songs. With the new album completed and released, the band are able to think about touring, and have already booked national tour dates, with regional and festival shows set to follow. 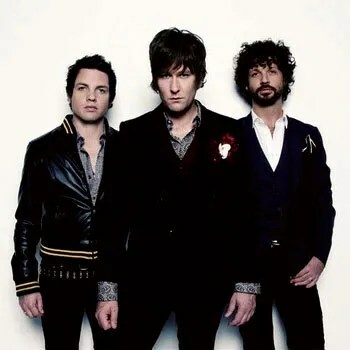 Both before and after their appearance at the Sydney leg of the Sound Relief charity concert, Eskimo Joe were touring overseas and especially in Europe, prior to devoting themselves to the Australian release of the new album. With four successful albums under their belt, Eskimo Joe should expect no problems filling large venues when they start their Australian tour. But when asked whether early, pre-album hits – like ‘Sweater’ and ‘Turn Up Your Stereo’ – ever make an appearance on live set lists, Kav shudders. Eskimo Joe play the Palace Theatre (formerly the Metro) in Melbourne on August 7, City Hall in Hobart on September 2, and Albert Hall in Launceston on September 3. Inshalla is out now. From Buzz Magazine, June 2009. This entry was posted on Friday, June 26th, 2009 at 4:37 pm and is filed under Buzz Magazine. Tagged: buzz, eskimo joe, metro, palace. You can feed this entry. You can leave a response, or trackback from your own site.